To analyze your occlusion, Dr. Canzoneri uses an innovative technological system called a T-Scan. You’ll first bite down on a tool that detects the intensity and location of forces between your teeth. Dr. Canzoneri can study the data to determine how your teeth hit, as well as the optimal occlusion. 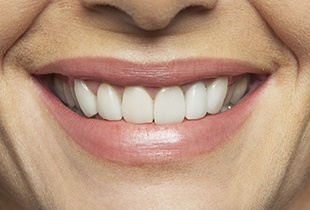 Creating restorations according to which teeth touch first, second, and so forth will deliver optimal occlusion after your full-mouth reconstruction is complete. This will ultimately promote comfort in daily oral function and also secure the longevity of restorations. Your full-mouth reconstruction plan may involve laser gum therapy, crowns, fillings, bridgework, partial or full dentures, and/or dental implants. Dr. Canzoneri will present options for addressing each issue, and he’ll also provide you with the information you need to make informed decisions for care. You’ll review your T-Scan images with Dr. Canzoneri to gain a better understanding of your situation. The dentist is always more than happy to answer questions and explain procedures and conditions, so please ask us about anything! Then, Dr. Canzoneri will work with you to design a custom full-mouth reconstruction plan to meet your needs. We offer sedation dentistry for patients concerned about anxiety or physical discomfort, and our front office will be happy to discuss financing arrangements for large cases. We don’t want fear, money, or anything else to stand between you and your ideal smile!